Establishing tariffs based on cost recovery principle. Water utilities do not generate sufficient revenues to ensure proper maintenance and sustainability of infrastructure as tariffs hardly cover operating and maintenance costs. As a result, tariffs need to be set according to sound cost recovery principles, especially since the investments required to upgrade the existing infrastructure will generate an increase in operational costs. Increasing wastewater treatment coverage to fight health and environmental issues. The number and standards of sewerage systems and wastewater treatment plants in BiH are unsatisfactory and are causing serious threats to human health and to the environment. Improving staff competencies and operational efficiency of utilities. The lack of qualified staff in water and wastewater utilities is problematic, and improvement in this regard is vital for comprehensive efficiency improvements in the water sector. Improving water quality and treatment of drinking water in rural areas. Turbidity, bacteriological contamination due to human activities, and the presence of chemicals (iron and manganese, among others) are making water undrinkable in rural areas. EC. 2010. IPA Support to Bosnia and Herzegovina Water Policy. Brussels: European Commission. FMPVS. 2012. Water Management Strategy of the Federation of Bosnia and Herzegovina. Sarajevo: Ministry of Agriculture, Water Management and Forestry of the Federation of Bosnia and Herzegovina. HEIS & PR. 2011. General Assessment of the Water Supply Sector and its Human Development Function in Bosnia and Herzegovina. Sarajevo: Hydro-Engineering Institute Sarajevo and PRISM Research. MSPCEE & MinAg. 2012. Integrated Water Management Strategy of the Republic of Srpska. Banja Luka: Ministry of Physical Planning, Civil Engineering and Ecology & Ministry of Agriculture, Forestry and Water Management of the Republic of Srpska. VM. 2011. Water Policy in Bosnia and Herzegovina. Sarajevo: Council of Ministers of Bosnia and Herzegovina. Economy. Bosnia and Herzegovina (BiH) faces the dual problem of rebuilding a war-torn country and introducing transitional liberal market reforms to its formerly mixed economy. The BiH economy relies heavily on the export of metals, energy, textiles, and furniture; industry represents 26.4% of GDP. The complex government structure hampers economic policy coordination and reform, while excessive bureaucracy and a segmented market discourage foreign investment, which has dropped sharply since 2007. The BiH private sector is growing slowly and government spending remains high, at roughly 40% of GDP. The country was affected by significant floods in May 2014, which generated an estimated US$1 billion in economic losses and damage. The unemployment rate is very high, at 44%, which restricts domestic private demand. The BiH population is composed of 48% Bosniaks, 37.1% Serbs, 14.3% Croats, and 0.6% minorities. More than half of the 3.8 million inhabitants live in rural areas, and agriculture accounts for nearly 20% of the occupied labor force and 8% of GDP. BiH has, since 2003, been recognized by the EU as a “potential candidate country” for accession, and became a full member of the Central European Free Trade Agreement in September 2007. It takes part in the Stabilization and Association Process, and a bilateral agreement was signed in 2008 and ratified in 2010, but has not yet come into force (CIA 2015). Water resources. With 9,781 m3/capita/year, BiH has abundant water resources, but they are unevenly distributed throughout the country. The waters of BiH are split between the Danube River Basin District and the Adriatic Sea Basin. A large part of the watercourses in BiH are international waterways; the Sava forms the country’s border in the north, the Una partly demarcates its western border, and the Drina makes up most of the country’s eastern border.The total renewable water resources in BiH of 9,781 m3/capita/year are unevenly distributed (FAO Aquastat 2015). The areas where water is scarce are those where it is most needed, such as the sub-basin of the Bosna River, which is densely populated and contains a large concentration of industries. The water scarcity period is June to September, when water is most needed by the population and for irrigation purpose. The most densely populated areas are also where water is most polluted, and many are not equipped with treatment systems. Surface water quality is a concern, particularly with regard to nutrient pollution in the Danube Basin. The entire Danube Basin and limited parts of the Adriatic Basin are classified as “sensitive areas” as defined by the EU Water Framework Directive. In addition, rainfall is highly seasonal, and in the summer some watercourses, especially on the Adriatic side, have significantly decreased runoffs. Heavy seasonal rainfalls can also produce severe flooding episodes causing widespread power outages, landslides, and damage to the infrastructure affecting water and wastewater services and resulting in serious drinking water shortages. Although climate change is expected to have a negative effect on both water availability and water demand, no specific strategies have been implemented. Water supply sources. Most of the drinking water comes from groundwater sources. In Bosnia and Herzegovina, groundwater provides 81% of total drinking water consumption (ICPDR 2015). With regard to the Water Framework Directive objective of good status, 6 groundwater bodies of the 22 in the country are considered to be “at risk” due to human intervention, 4 are at risk in terms of both quantity (due to overextraction) and quality, and the rest are threatened with quality risk only (ICPDR 2007). Industries in BiH mainly use water from their own sources and only partly from the public water supply system. Industrial production is greatly reduced compared to the beginning of the 1990s (around 35% of prewar capacity) (NEAP 2003). As a result, water consumption in the industrial sector has been reduced, as has effluent production. The use of fertilizers and pesticides in agriculture has also declined. Service provision. Local governments are responsible for water and sanitation services and provide them through 142 public utility companies. 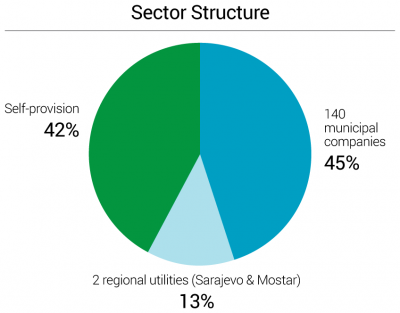 With an average population served of 15,641, the water sector in BiH is dominated by six large water and sanitation services providers in the cities of Sarajevo and Mostar serving about 13% of the population. Small and medium-size municipal water utilities serve about 45% of the population. The rest of the population relies on self-provision (Figure 1). Utility companies provide both water and sewerage services, except in larger cities, where separate utility companies operate. According to the report “Water Policy in Bosnia and Herzegovina” (VM 2011), the public water supply systems managed by municipal water supply utilities cover 58% of the population in BiH (60% in the FBiH and 57% in RS). The Ministry of Foreign Trade and Economic Relations is the competent state-level ministry for BiH in charge of policy making, and coordinating and harmonizing the activities of both FBiH and RS in the areas of agriculture, energy, environmental protection, development, and exploitation of natural resources and tourism. The Environmental Protection Fund has a crucial role in financing activities regarding environmental protection, including water preservation and protection from flooding. The Ministry of Agriculture, Water Management and Forestry in FBiH and the Ministry of Agriculture, Forestry and Water Management in RS are the line ministries responsible for water policies in their respective entities. These Ministries have legislative competence in the water sector and supervise the implementation of laws concerning the water sector. The Ministry of Spatial Development, Civil Engineering and Ecology in RS is responsible for supervising and monitoring activities related to public communal services, including drinking water and wastewater collection and treatment. It is also in charge of overseeing the implementation of laws on communal affairs. The Ministry of Environment and Tourism in FBiH is responsible for supervising and monitoring activities related to local public services, including drinking water and wastewater collection and treatment. The Institutes of Public Health in RS and FBiH are responsible for monitoring drinking water quality. The Cantonal Ministries are responsible for tariff supervision in the FBiH, whereas tariff oversight remains under the umbrella of municipalities in RS. In FBiH, cantons are responsible for administrative supervision of communal affairs and of water management at the local level. Capacity and training. International organizations are key players in staff capacity building. Water services management staff are appointed by municipal representatives without specific qualification or experience requirements. This results in significant turnover according to political cycles, and appointment of management personnel who lack appropriate skills and competencies. Currently, water utilities do not conduct staff training programs except in the framework of cooperation projects funded by donors. Development of human resources led by trained experts is not considered a high priority, and the current financial situation in water utilities excludes the possibility of implementing staff training and capacity-building policies. Water utilities suffer from a lack of skilled staff for both management and technical positions. The association “Vodovodi Republike Srpske” (Waters of Srpska Republic), created in 2007, provides limited technical assistance to water stakeholders and promotes knowledge exchange activities. In FBiH, the national municipal utility association covers multiple services and is not specifically water oriented. In addition, the association for water and environmental protection, sector “Aquasan Network in B&H” conducts capacity building for professionals from both entities including exchange of knowledge, experience, and information sharing with a focus on water and wastewater management. Economic regulation. Water tariffs are supervised at the local level. The water sector in BiH is regulated through a public self-regulated model, since neither a national regulation agency nor an official national benchmarking system has been implemented. Tariffs are revised upon request of utilities. The new tariff proposal must then be approved by municipal authorities in RS, and by municipalities and cantonal authorities in FBiH. By law, water utilities must provide an audit of their financial reports certified by an independent auditor, but this obligation is neither fully nor regularly implemented by all water utilities. The results of such audits for the FBiH are not available to the public, whereas the results for RS can be found on the stock exchange website. Ongoing or planned reforms. A water strategy has not been fully implemented on the ground yet. In 2011, BiH developed a strategic document entitled “Water Policy in BiH” (VM 2011), which identifies water management priorities through 2035. These priorities target water use (improvement of coverage and public water supply systems while ensuring sustainable use of water), protection against floods, and wastewater treatment. However, the effective implementation of those strategic objectives is still partial, and there are important gaps remaining between written priorities and action on the ground. As a result, only about 56% of strategies and organizational structures prescribed for monitoring and managing water supply have been implemented (UNDP 2009). Finally, UNDP is providing specific technical support through joint programs to explore different models of establishing a more formal regulatory framework in both entities (UNDP, MDG-F). Services coverage. BiH has traditionally enjoyed a good level of service, with 88% for access to piped water and 91% for flush toilets (Figure 4). Access to publicly provided services is lower, at 58% for public water supply and 31% for sewerage. Only 3% of the population is connected to wastewater treatment plants. Equity of access to services. Access to water and flush toilets is problematic for the Roma population. Access to piped water and flush toilets is high for the bottom 40% of the population (81% and 82%, respectively). But the Roma population is marginalized and mainly lives in informal settlements that lack basic facilities, including access to potable water. Access to drinking water within close proximity to schools in rural areas and to units of disabled persons is limited compared to that for other persons. There is no reliable, country-wide, publicly available source of information on water services performance in BiH. Quality of service. Drinking water quality remains an issue. Average water consumption in Bosnia and Herzegovina is 168 liters per capita per year. Generally, water utilities are successful in maintaining a 24-hour water supply of adequate quality. However, there are still interruptions of service, the frequency and duration of which depend on regional and seasonal contexts. Twenty-one percent of water samples fail tests for drinking water sanitary standards. The number of tested samples is insufficient, and laboratories are equipped for only standard chemical and microbiological analyses. As a result, parameters such as heavy metals, pesticides, phenols, and mineral oils, among others, cannot be controlled. Whereas water utilities have defined a first sanitary protection zone around their water sources, they almost never implement a secondary protection area. As a result, preventive measures to preserve water resources quality are minimal or nonexistent. Moreover, in rural areas, they produce drinking water using chlorination, which is performed manually or sometimes badly performed. However, in urban water supply systems, disinfection is provided mainly by automatic gas chlorinators. Customer satisfaction. According to the 2013 Gallup poll, 76% of the population is satisfied with the service provided in their city (Gallup 2013). This number comports with the average satisfaction rate in the region. Water utility relations with customers are mostly directed to dealing with complaints rather than improving customer satisfaction. No customer satisfaction survey has ever been conducted in the country. Overall efficiency. The efficiency of public water and sanitation service providers is a continuing issue in BiH. Before 1991, maintenance and repair were not carried out systematically on water supply systems, and during the war they often did not function. In some areas, the war caused serious destruction to networks and water supply facilities. Nonrevenue water ranges from 30 to 75% in the water supply systems for households, and is 55%, on average, which is much higher than best practices in Western Europe. Water metering covers 82% of households, but a significant number of water meters are outdated or were damaged during the war and do not function properly. Some utilities have intensive water meter replacement programs, since the inability to measure water consumption has financial and billing consequences. The billing collection rate in 2014 was 85%. Public institutions, such as military institutions, hospitals, schools, and government institutions, are bad payers, and utilities almost never recover those outstanding receivables. With an average staffing ratio of 15.8 employees per 1,000 connections (with a range from 3 to 26), the sector is less productive than international best practices of 1 and 2. The limited productivity is largely a consequence of the atomization of the sector and, to some extent, the direct control exerted by local government authorities over utility staffing and management. Recent trends. No significant progress has been made on the efficiency agenda over the last 10 years. Most of the indicators mentioned above show no significant improvement, except in the collection rate, which appears to have steadily increased over the last decade to 85% (Figure 5), which has allowed utilities to generate more revenues to cover their costs. This evolution is correlated with an improving metering level, which enables a more accurate measure of water consumption. Overall sector financing. 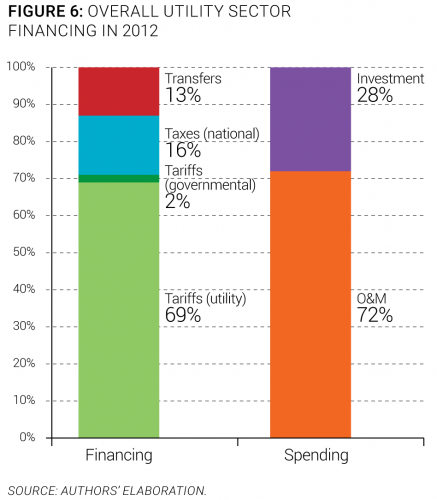 Tariffs are the dominant funding source of the sector (Figure 6). They hardly cover operation and maintenance expenses, which represent 72% of sector costs. Subsidies from the national budget are therefore necessary to fund investments. Transfers appear to be limited, at only 13% of sector funding. 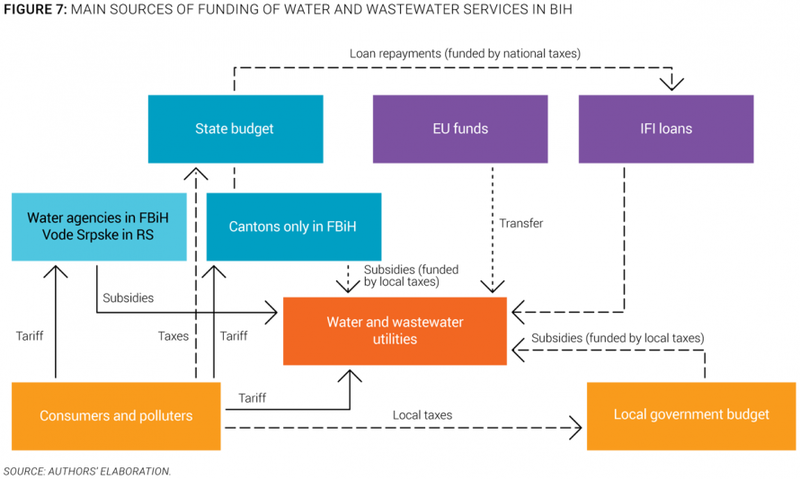 The main sources of funding of water and wastewater utilities in BiH are described in Figure 7, using the OECD three Ts methodology (tariffs, transfers, and taxes). Investments. 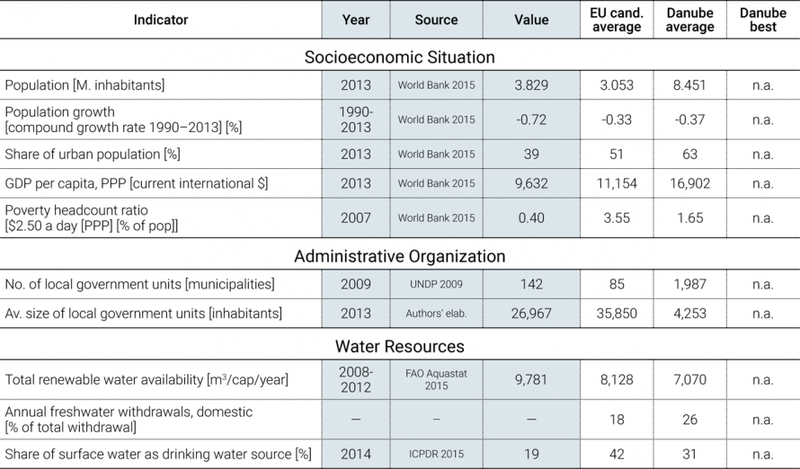 The EU has been a key donor for water sector investments since 1998. 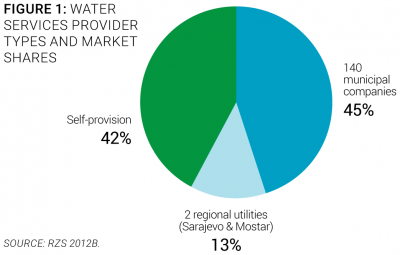 Few data are available regarding past investments in the water sector in BiH. Key features of European assistance include support to integrated water resources management based on the river basin model, and assistance preparing and implementing water legislation in line with the wastewater treatment directive and the water framework directive, as well as funding of water and wastewater investments. Cost recovery. Water utilities hardly cover their operational costs with tariffs, and fall short of funding for investment projects. Moreover, an important share of utility companies receives operational subsidies, because tariffs are too low to cover their operational costs. The lack of funding for water services is largely attributable to their limited autonomy and dependence on municipalities, which are not favorable to tariff increases. Water is considered a social good, so its price is kept low. 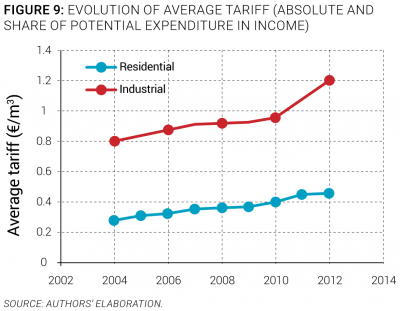 Significant cross-subsidies exist between residential and industry tariffs, with industrial tariffs being 50% higher than residential tariffs. Tariffs. Tariffs increased 6% per year between 2005 and 2012, and will continue to do so in the near future. The majority of water utilities bill their customers based on volume consumed, and almost all water services measure the consumption of large commercial/industrial customers. For households, if the utility does not have functional water meters for private houses or apartment buildings, the tariff is based either on an assessment of the expected consumption of the household or on a flat rate per person. In most cases, a VAT (17% to the total amount), water protection, and water abstraction fees are added to the bills. In addition to the fee based on the amount of consumed water, there is a monthly fee for water meter maintenance for all customers, levied on the basis of water meter diameter. Average residential tariffs are €0.61/m3, which are lower than the regional average. Tariffs increased on average by 6% per year between 2005 and 2012 (Figure 9), while the annual inflation rate was 2.8% (World Bank 2015). They are expected to continue to increase. Affordability. Due to a lack of data, the average share of water and wastewater expenditure of household income could not be appraised. As a result, the affordability of water could not be characterized or analyzed. In order to evaluate the sustainability of services in the region, an overall sector maturity assessment was done taking into account four main dimensions: access to services, quality of services, efficiency of services, and financing of services. Each of these dimensions is measured through three simple and objective indicators. For each indicator, best practice values are established by looking at the best performers in the region, and countries closest to those best performers are deemed to have a more mature sector. A more complete description of the methodology to assess sector maturity is included in the Annex of the State of the Sector Regional Report from the Danube Water Program. The outcomes of this assessment for the Bosnia and Herzegovina water sector are displayed in Figure 10, which also shows average and best practices in the Danube region. The BiH sector maturity score is 57, which is close to the Danube average maturity of 64. The assessment shows that, on average, the country performs well in terms of access to piped water and flush toilets, and customer satisfaction. With regard to the BiH water sector, the main deficiencies identified through the sector maturity assessment are level of investment, staffing level, and wastewater treatment coverage (Figure 10). Establishing tariffs based on cost recovery principles. Water utilities do not generate sufficient revenues to ensure proper maintenance and sustainability of infrastructure as tariffs hardly cover operating and maintenance costs. For many utilities, subsidies from local budgets are needed to cover routine operation and maintenance costs. This situation threatens the long-term sustainability and good performance of water and wastewater services. To reverse this trend, tariffs need to be reviewed and set according to sound cost recovery principles, especially since the investments required to upgrade the existing infrastructure will generate an increase in operational costs. Improving staff capacity and operational efficiency of utilities. The lack of qualified staff in water and wastewater utilities is problematic, and improvement in this regard is vital for comprehensive efficiency in the water sector. The larger water utilities generally have sufficient skilled employees, and are provided with the necessary equipment to efficiently manage the service. But the smaller utilities are frequently struggling due to weak organizational structures, lack of skilled professionals, limited staff capacities, and a lack of basic equipment for network mapping, leak detection, accounting, and water quality monitoring and metering. As a result, the operational efficiency of those services (nonrevenue water, billing ratio, operating cost coverage, for example) is low and could be improved. Improving water quality and treatment of drinking water in rural areas. Turbidity, bacteriological contamination due to human activities, and the presence of chemicals (iron and manganese, among others) are making water undrinkable in rural areas. Chlorination of raw water has limited results, and treatment installations to tackle water turbidity are rare in BiH. The presence of bacteria (Escherichia and Streptococcus, among others) sometimes exceeds allowed post-treatment values, and residual chlorine borders mandatory standards. Alternative suitable methods to solve bacteriological contamination should be considered through water treatment infrastructure upgrading and implementation of new treatments (such as ozone application). Insufficient and inadequate monitoring of drinking water quality also needs to be addressed. BHAS. 2013. Statistical Bulletin No. 13. Sarajevo: Agency of Statistics of Bosnia and Herzegovina. FMOiT. 2015. Ministry of Environment and Tourism of the Federation of Bosnia and Herzegovina. Accessed 2015. http://www.fbihvlada.gov.ba/english/ministarstva/okolis_turizam.php. FZS. 2014. Statistical Yearbook. Sarajevo: Institute for Statistics of the Federation of Bosnia and Herzegovina. —. 2015. Institute for Statistics of the Federation of Bosnia and Herzegovina. Accessed 2015. http://www.fzs.ba. Gov. RS. 2015. Government of the Republic of Srpska: Water Balance in Republic of Srpska 2011. Accessed 2015. http://www.vladars.net. ICPDR. 2007. Danube Facts and Figures - Bosnia and Herzegovina. Vienna: International Commission for the Protection of the Danube River. NEAP. 2003. National Environmental Action Plan of Bosnia and Herzegovina. Sarajevo: National Environmental Action Plan Directorate of Bosnia nad Herzegovina. RZS BiH. 2014. Statistical Yearbook. Banja Luka: Institute of Statistics of the Republic of Srpska. UNDP. 2009. GoAL WaSH Programme - Governance, Advocacy and Leadership for Water, Sanitation and Hygiene - Bosnia and Herzegovina. New York City: United Nations Development Programme. UNDP/GEF DIKTAS. 2012. National Report Bosnia-Herzegovina. New York City: United Nations Development Programme/Global Environment Facility - Protection and Sustainable Use of the Dinaric Karst Aquifer System. UPKP. 2015. Association of the Employers of Utility Companies in Federation of Bosnia and Herzegovina. Accessed 2015. http://www.upkp.com.ba/cv.htm. This note has been prepared by Maria Salvetti, consultant, with support from Igor Palandžić, World Bank, based on the data collection by Nebojša Budović and Selim Babić, local consultants. It is part of a regional State of the Sector review led by David Michaud, World Bank, under the Danube Water Program financed by the Austrian Ministry of Finance, whose support is gratefully acknowledged. The authors welcome comments and can be contacted through David Michaud (dmichaud@worldbank.org).